AR&Co, one of the Wold’s leading & Asia’s largest Augmented Reality and Innovative Technology company once again proudly brings Indonesia’s creative industry into global market and recognition. 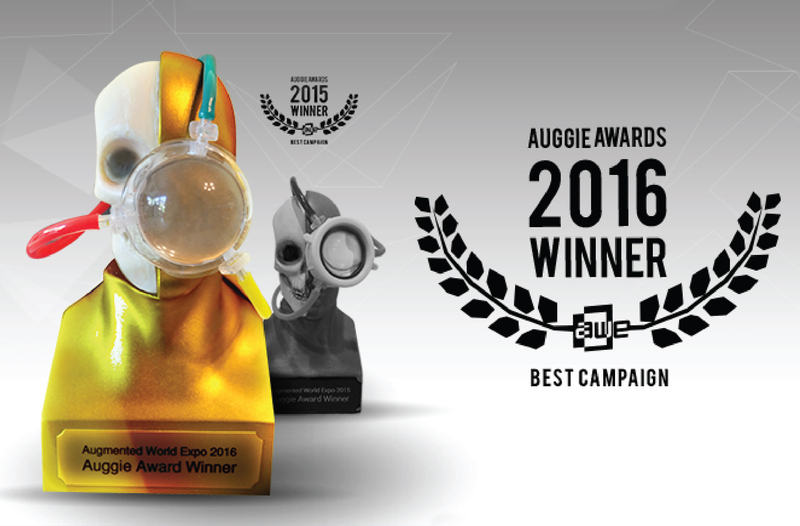 On the 1st of June 2016, AR&Co was publicly awarded Best Campaign for its ‘Dutch Lady Flying Farm’ mobile application during the seventh and biggest Augmented World Expo (AWE). Held in Santa Clara California, otherwise known as Silicon Valley USA, AWE is the largest event dedicated to AR, VR and Wearable Technology, gathering together over 4,000 attendees and 200 speakers from all over the world. Participating companies for this year’s AWE include DAQRI, Google, Epson, Intel, Meta, 20th Century Fox, BOSCH, and many others. This year, 180 submissions were seen across the Auggie Awards categories. The nominees with the highest public votes in each category were selected as finalists. Following on from last year’s participation in AWE as AR&Co took home the Auggie Award for Best Campaign 2015 with the ‘Next for Nigeria’ mobile application, this year AR&Co submitted and showcased three projects as Auggie Award nominations within the different award categories. Each AR&Co nomination received public voting and achieved finalist positions in each of their respective categories. The ‘Hilo School AR Coloring’ app achieved Auggie Award 2016 finalist in both the category of Best App sponsored by ODG and also in the category of Best Campaign sponsored by Bosch & Re’flekt. AR&Co’s ‘Become a Butterfly AR T-Shirt’ project achieved the position of Auggie Award 2016 finalist in the category of Best Art of Film sponsored by the CFC. The Dutch Lady “Nông Trại Bay” or Flying Farm app is an augmented reality mobile-based application developed by AR&Co for Dutch Lady being the FrieslandCampina Group’s well-known milk brand. Together with Leo Burnett Vietnam, AR&Co launched this special app to support Dutch Lady’s campaign. Through the app, Dutch Lady Vietnam customers can have a unique Augmented Reality experience being introduced to the cute new Dutch Lady mascots, Matt and Bella, along with their entire digital Holland farm. The FrieslandCampina Group wanted to try a fresh approach to reaching young children and their moms in an exciting and interactive way, increasing emotional attachment towards the characters and in the end, the brand. This app is instinctively easy to use and has caught the amazement of both children and adults alike. The interactive method of storytelling combined with creative use of campaign gimmicks helped boosting product sales and creating emotional attachments, thus achieving the objectives for both brand building and marketing. Within such a short time period after it was launched, the app has achieved over 40,000 downloads as well as a reported 19% increase in product sales.